Just about everything I read about French women and their nutrition involves plenty of herbal teas or tisanes. A tisane simply refers to an herbal or fruit mixture that is steeped in hot water to make a tasty, soothing, or comforting beverage. You can buy tisane mixtures pre-made, or make your own using various items from your kitchen and herb garden. I go easy on caffeinated beverages (they’re a treat for me) since they impact my blood sugar and energy levels in a not-so-great way. I’m also not one to go for sugary beverages like soda or juice. While water is lovely, who doesn’t love variety as well? Tisanes can provide you plenty of variety if you decide to venture down the rabbit hole. I often enjoy this tisane around 4pm in the afternoon in between meals. I may start craving something not because I’m physically hungry, but out of a desire for a break or entertainment. Snacking is nearly shocking to many French people and if you can transition to a no-snacking, 3 meals a day lifestyle, your ability to maintain the body you want will very likely improve. This tea uses fresh ginger root and slices of lemon steeped to your preference. While I used a great loose-leaf tea mug gifted to me by family during the holidays, you can use a tea steeper, or simply plunk it all in there and fish it out with a spoon later. I absolutely do this plenty since I’ve only collected one loose-leaf tea mug so far. That being said, this mug is so pretty and useful. Plus I love it because it’s called the KATI cup. Just looking at the different designs, I anticipate I’ll be adding the Petal Drops to my collection soon! The KATI cup includes a loose-leaf tea strainer within it and was gifted to me by a family member along with the absolute treat of a loose-leaf tea and tisane sampler set by Tea Forte. It’s hard to pin down favorites of that entire sampler because they were all delicious. However, the ginger lemongrass and the Earl Gray each stand out easily in my memory. I’ll be replenishing my supplies of them, soon! 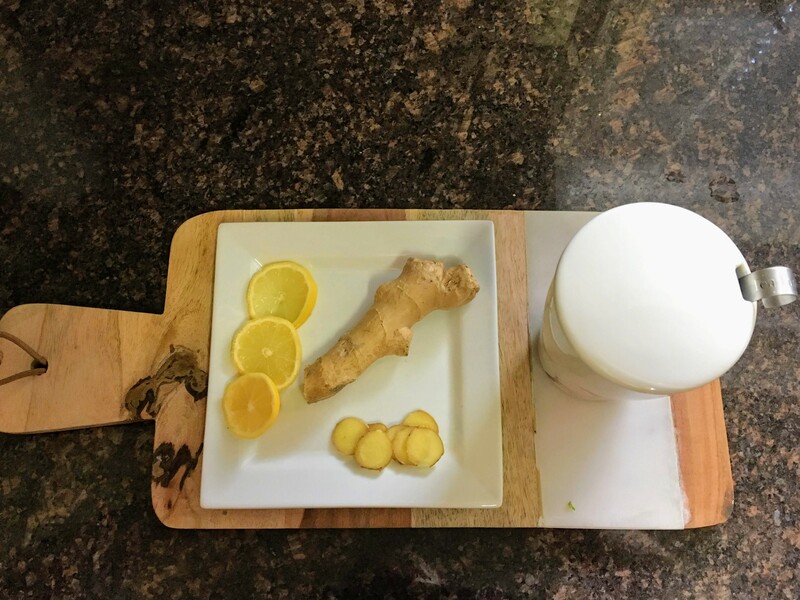 In the meantime, this ginger-lemon homemade tisane is a worthy addition to your daily or weekly tea enjoyment. It is citrusy and zesty and surely is an antioxidant rich for all of your cells. Make it as strong or as weak as you like. 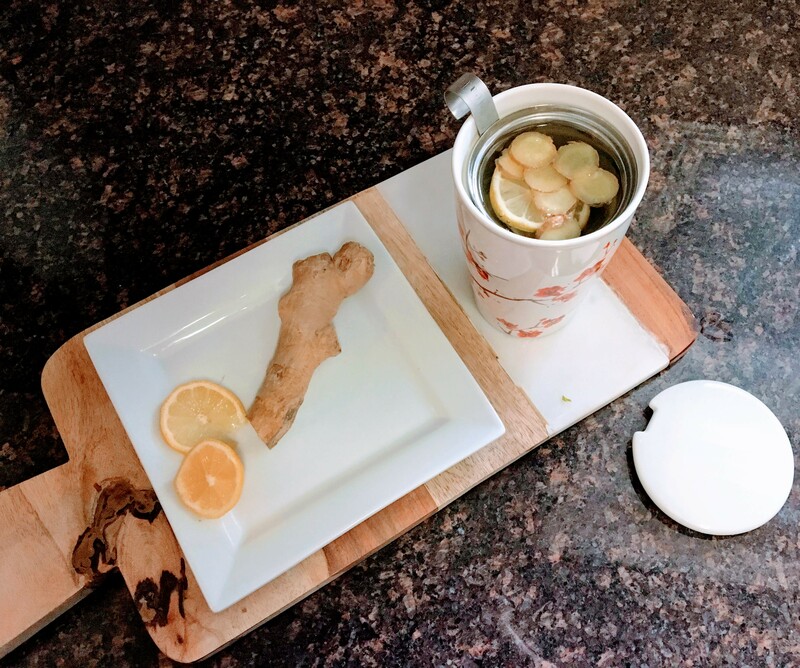 Ginger-Lemon Tisane can be enjoyed hot or cooled depending on whether you would like being warmed up or cooled down by its citrusy, grounding, ever-so-slightly spicy essence. Wash the ginger and lemons (see notes on lemons). Boil water. Once water has reached boiling, turn off heat and let it cool for a few seconds so that it’s no longer bubbling. Place ginger and lemon into your mug and fill your mug with water. Place a lid or plate over your mug to retain heat while steeping. Steep for 3-5 minutes depending on desired strength. 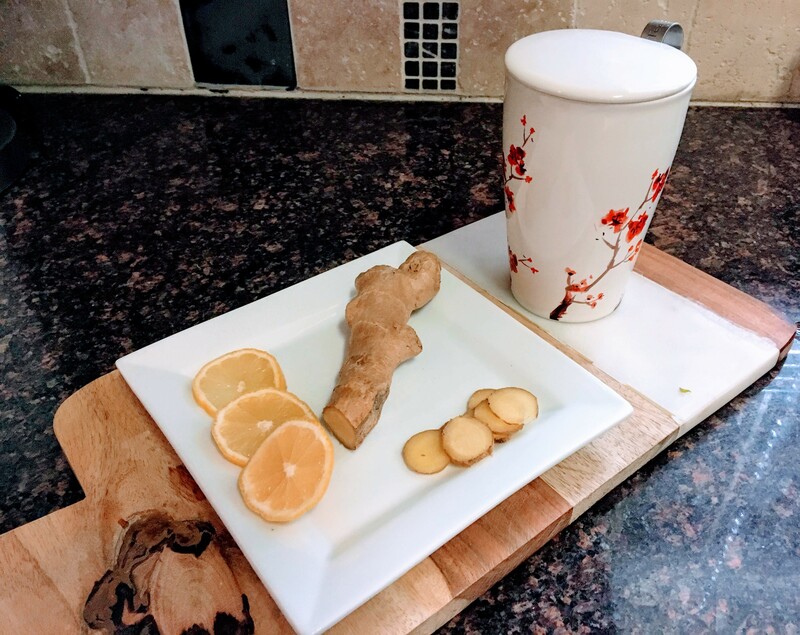 Remove ginger and lemon, and enjoy your tisane. If you have organic lemons, leave the rind on. If you have nonorganic lemons, consider soaking the lemon in a vinegar bath (2 tbsp vinegar to a cup of water) for 10 minutes or washing it thoroughly with soap and water prior to using. Alternatively, use the lemon without the rind. The goal here is to minimize contact with pesticides as citrus is known to be treated heavily. If you are using a mug with a strainer like the Kati Mug, consider finely chopping the ginger and lemons. The more surface area the water accesses, the more goodness will be steeped out of the lemon and ginger. However, if you will be fishing the lemon and ginger out with a spoon after steeping, leave them in larger slices. If I don’t finish my mug, I’ll place it in the fridge and enjoy it cooled the following day. Will keep in the fridge for 2-3 days.